When one reads these strange pages of one long gone one feels that one is at one with one who once [was]. 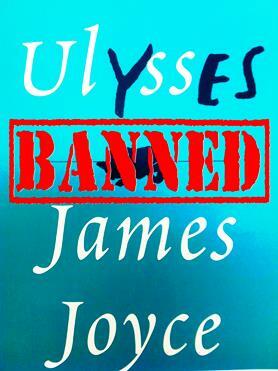 The revised edition follows the complete and unabridged text of ULYSSES as corrected and reset in 1961. Like the first American edition of 1934, it also contains the original forward by the author and the historic court ruling by Judge John M. Woolsey to remove the federal ban on ULYSSES. It also contains page references to the 1934 edition, which are indicated in the margins. Stephen Dedalus and his roommate, Buck Mulligan, breakfast. Stephen experiences guilt over the passing of his mother. Mulligan demands a loan; Stephen determines to move out. Stephen teaches history and wonders how parents love unattractive children. Stephen collects his pay from his anti-Semitic employer. Stephen broods about Sandymount Strand contemplating life. Joyce’s wildly-shifting stream of consciousness becomes the norm. Like an episode in Dr. Who, the reader shifts time and place. Now we meet Leopold Bloom, an ad-man of Jewish descent. Bloom cooks and eats a pork kidney, reads correspondence from his wife’s lover and his daughter, and completes his morning constitutional in the outhouse. Bloom ambulates to the post office, where he receives a letter from his love interest. He then ogles a woman in stockings and destroys his letter. Wandering into church, Bloom ruminates on theology before visiting a chemist, where he purchases soap. Leaving the chemist, Bloom meets an acquaintance. When the two part ways, Bloom heads towards the baths. Bloom attends Paddy Dignam’s funeral, where he converses with Stephen’s father about death and burial traditions. From his taxi, Bloom also observes both Stephen and Blazes Boylan (Molly’s lover). Evidencing his own guilt and need for paternalism, Bloom reflects on the death of his son, Rudy. After the service, Bloom leaves with the funeral cart. Here, the layout mimics a tabloid newspaper. Bloom attempts (unsuccessfully) to place an advertisement in the Freeman’s Journal. Although Stephen is also in the office, he and Bloom do not meet. Stephen and a group of office workers then head to a pub. Bloom searches for lunch. Repulsed by animal-like manners of diners at Burton Hotel, Bloom instead patronizes Davy Byrne’s pub, where his repast consists of a gorgonzola cheese sandwich and a glass of burgundy. Lunchtime musings light upon the rise and fall of Bloom’s marriage and the anatomical correctness of Greek sculpture. On his way to the museum, Bloom glimpses Boylan and seeks refuge in a gallery adjacent the museum. At the National Library, Stephen Dedalus debates the origins, merits, and authorship of Shakespeare and his works. Looking for an old ad copy, Bloom also enters the library. He and Stephen briefly cross paths at the end of the episode. 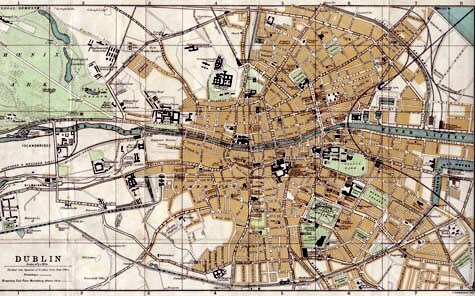 Taking a short break from Stephen and Leopold, the plot follows various characters through the streets of Dublin. The procession of the Lord Lieutenant, William Ward, Earl of Dudley, unifies the narrative. Bloom dines with Stephen’s uncle while his father sings. Molly rendezvous with her lover, Blazes Boylan. The narrative now follows an unnamed Dubliner who witnesses an argument between Bloom and an anti-Semitic diner in Barney Kiernan’s pub. The episode is notable for its tangential thoughts, including legalese, the Bible, and Irish mythology. This episode caused Ulysses to be banned and burned by the United States Postal Service. Copying the style of a romance novel, the episode shadows Gerty MacDowell. Bloom watches her, fantasizing to meet his carnal desires. His mood dies as Gerty reveals her lame leg. Several asides later, Bloom decides to visit a friend in hospital. Bloom visits his friend and heads to a bar where he meets Stephen Dedalus. In this episode, Joyce uses wordplay to tell the history of the English language. Joyce moves from Latinate through several eras and various authors, ending the episode with unintelligible gibberish. This episode mirrors a play script. Highly intoxicated, Bloom and Dedalus enter Dublin’s red-light district. The pair begins to hallucinate; their fears and passions are brought to life. Stephen vandalizes a brothel and attacks an English soldier. Bloom “sees” his son brought back to life. Bloom and Dedalus find refuge in a cabman’s shelter, where they encounter a drunken sailor. Confusion and mistaken identity ensue as their identities are repeatedly questioned. Rambling and strenuous, the narrative reflects the psychological state of the men. The pair returns to Bloom’s home; Stephen refuses Bloom’s offer of a place to stay. After relieving themselves, the two part ways. Written as a catechism, this episode is one of the easiest to understand, since the questions preceding each section alert the reader to the topic at hand. Bloom and Molly lie in bed, where Molly’s thoughts flit about before settling on a remembrance of her and Bloom’s engagement. We can only assume that the next day was unremarkably similar. 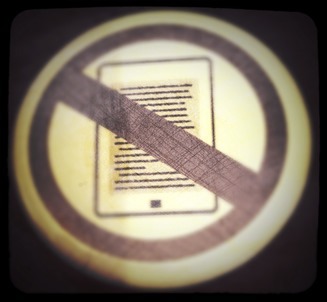 Disclaimer: I read this book on an e-reader, and hated the experience. I tried not to let that fact influence my judgement; however, the fact that I could not easily mark pages or flip back to reread segments annoyed me to no end. I read Ulysses as a bet to myself. I’d attempted the work several years ago, but failed to read past the first five pages or so. This time, though, Banned Books Week provided the motive I needed. Although a myriad of guides exist to help readers tackle Joyce’s epic, I chose to go alone. As most of you probably know, critics consider Ulysses one of the greatest – if not the greatest – modern work of English literature; it is without a doubt the greatest work to ever come out of Ireland (well, there is the Book of Kells…) Written over the course of seven years, Joyce follows Leopold Bloom and Stephen Dedalus through Dublin on June 16, 1904. Ulysses is well known for its plethora of allusions, references, and outright gibberish. Joyce once said, “I’ve put in so many enigmas and puzzles that it will keep the professors busy for centuries arguing over what I mean.” He wasn’t exaggerating. What can I say about Ulysses that hasn’t already been said by people much more intelligent than I? The sprawling work threatens to consume the unwary. Joyce modeled Ulysses after Homer’s Greek epic The Odyssey (something I figured out halfway through), and – like Odysseus – Ulysses is a long journey home. I might not enjoy giblets as much as Bloom, but I appreciate the imagery. Joyce’s mastery allows me to see, taste, and smell the food Bloom consumes. This is just one of many instances; Bloom was a foodie before it was hipster. However, I cannot help but think that every character in Ulysses is a lost cause. Stephen’s mother is dead; he can never gain the forgiveness and absolution he seeks. Bloom’s son is dead and his wife an adulteress; it is highly unlikely he will ever have the progeny he desperately desires. The food, the alcohol, the prostitutes, the music, and the workplace all provide distraction, but they do not provide answers. When they awake on June 17, their plights will be exactly the same. Nevertheless, don’t let me dissuade you from embarking on your own journey. Ulysses cannot be described; it must be experienced.